Hike the Coosa Backcountry Trail and the Duncan Ridge Trail at Georgia’s Vogel State Park, climbing to beautiful vistas on the Blood Mountain summit. Soaring and stunning, Blood Mountain is famous for its breathtaking, long-range views. Blood Mountain towers above nearby Vogel State Park, and stands as the highest elevation summit on the Appalachian Trail in Georgia. And thanks to its popularity and beauty, the mountain is one of the most popular trails in North Georgia during peak spring and fall hiking seasons. This hike departs from Vogel State Park, following a longer (and considerably less crowded) 8.5-mile round-trip hike to the Blood Mountain summit. 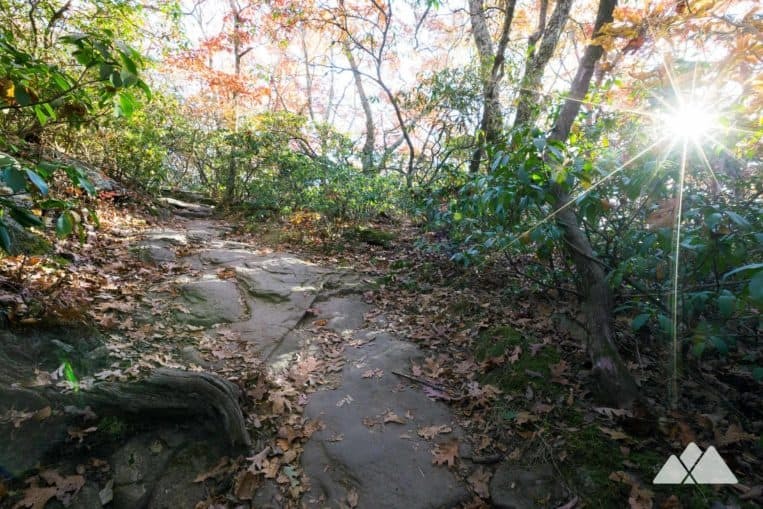 Compared to the more popular (and shorter) route to the Blood Mountain summit from Neels Gap, this hike’s trailhead at Vogel State Park offers ample parking, for a small fee. (Parking at Neels Gap is limited, and can fill up quickly during peak season.) 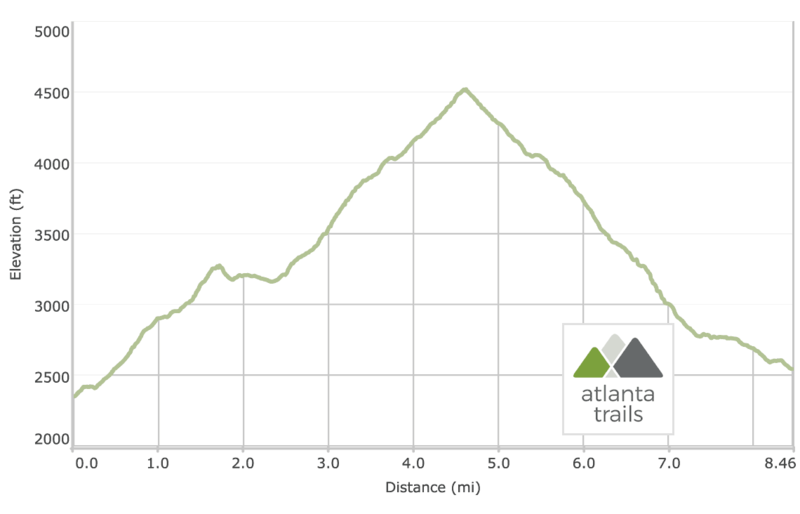 And, while it’s a slightly longer route, it’s an ultra-scenic one, scoring elevated views of Vogel’s Lake Trahlyta and exploring a beautiful forest on the way to Blood Mountain’s soaring views. Please note, before you go: this route follows more than one trail, and requires some careful navigation. 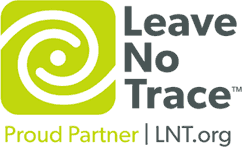 Please be sure to pack a paper trail map and compass to aid with the navigation. The adventure begins at the Vogel State Park backcountry trailhead (view maps and driving directions), following a spur trail westbound from the trailhead. At just under a half mile, the hike reaches an intersection with the Bear Hair Gap Trail loop. The route turns right at the intersection, climbing through switchbacks in a steady climb and exploring a sun-dappled, stream-filled forest. The hike follows a short side trail at 1.5 miles, trekking to an overlook with outstanding views of Vogel’s Lake Trahlyta to the northwest and through-the-trees views of the towering, majestic peak of Blood Mountain to the south. This hike is a great workout, and the overlook’s vantage point helps put it in perspective. The hike departs from the overlook, retracing its steps to the Bear Hair Gap Trail and crossing Wolf Branch Creek. The hike reaches a signed intersection at 2.5 miles, turning right to follow the Coosa Backcountry Trail. The Coosa Backcountry Trail soon intersects with the Duncan Ridge Trail. 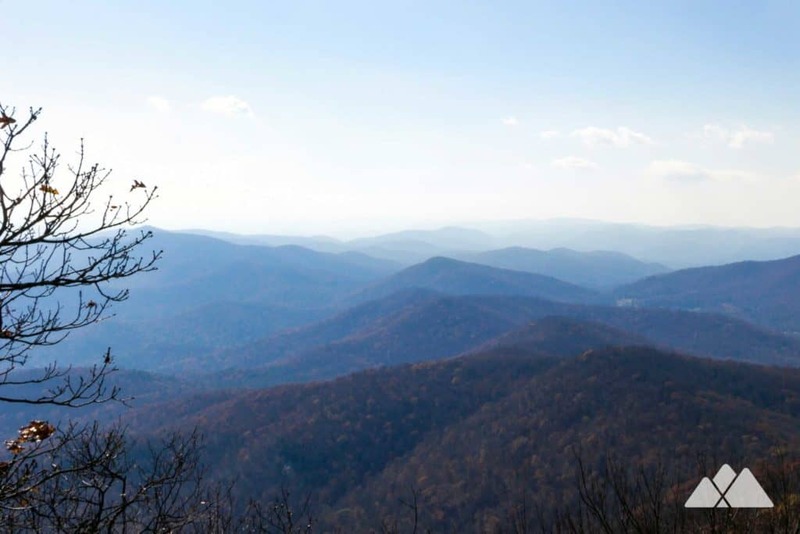 The route follows the Duncan Ridge Trail to the southeast, carving through switchbacks in a nearly unrelenting climb to the Appalachian Trail. As the route rises steadily toward Blood Mountain, the forest’s hardwoods give way to gnarly-branched rhododendron and mountain laurel. The terrain becomes rocky, exposing vast stretches of lichen-covered rock outcrops and mossy, scattered boulders. The Duncan Ridge Trail meets the Appalachian Trail at 4.25 miles, turning left to follow the AT’s iconic white, rectangular blazes. The hike reaches the 4,458-foot Blood Mountain peak at 4.6 miles. Several scattered, lofty rock outcrops at the summit provide stunning, soaring views of the blue-hued ridges in the distance. Cherokee legend holds this summit as sacred. Nearby at Slaughter Mountain, the Cherokee fought a bloody battle with the Creek, lending to Blood Mountain’s ominous name. The mountain’s beauty is abundant, with stunning views, birds soaring above in thermal uplifts, and the rugged, windswept beauty of the surrounding forest. It’s easy to understand why the Cherokee held this place in such high esteem. The summit is home to an Appalachian Trail Shelter, which offers primitive lodging for hikers on an epic, 2,000+ mile hike from Georgia’s Springer Mountain to Maine’s Mount Katahdin. 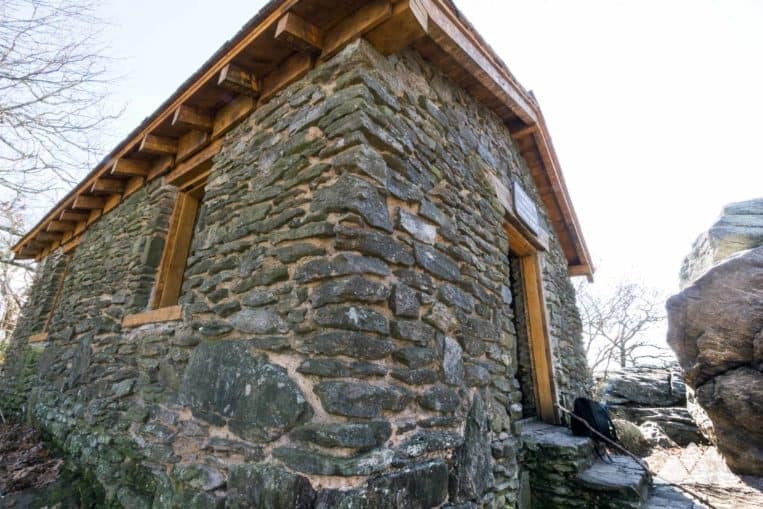 The shelter was built in 1934 by the Civilian Conservation Corps, and underwent a major renovation in 2012 led by the Georgia Appalachian Trail Club. 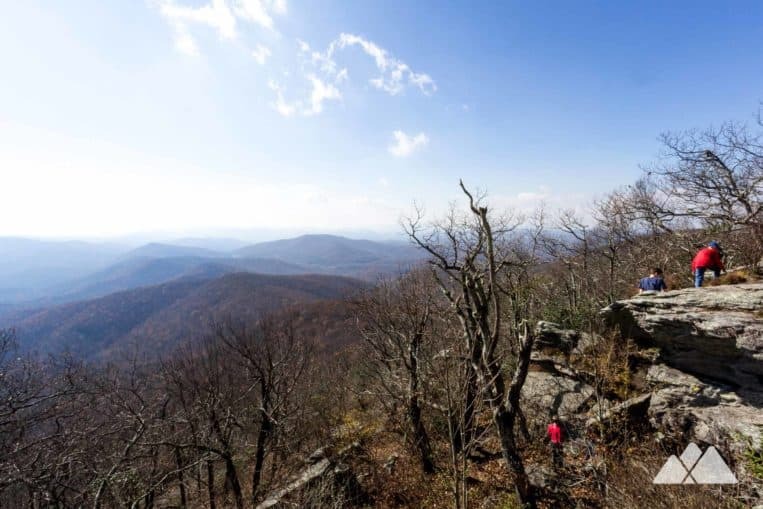 After soaking in the sublime summit views, this hike departs the Blood Mountain summit, retracing its outbound route on the Appalachian Trail. 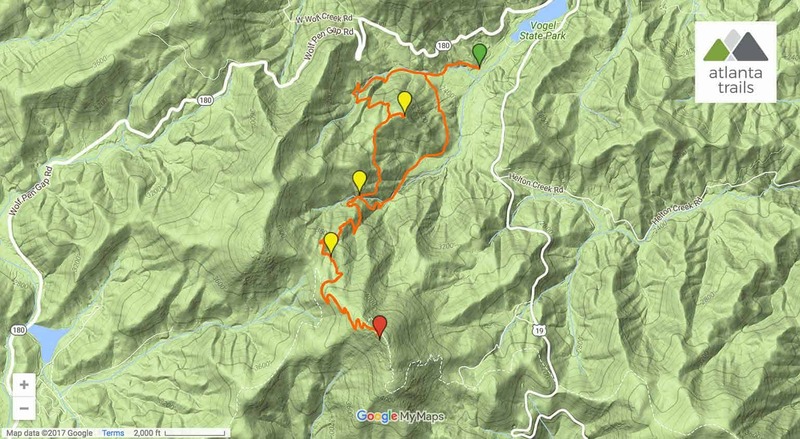 The hike reaches the intersection of the Duncan Ridge Trail at 5 miles, and follows the Duncan Ridge trail as it descends to the Coosa Backcountry Trail junction near Slaughter Gap. Reaching the intersection with the Bear Hair Gap Trail, this route veers eastbound, following the eastern portion of the Bear Hair Gap loop for a more direct return to the trailhead. The trail descends through an old-growth pine forest and passes through several large rock outcrops before crossing Wolf Creek at 7.35 miles. The hike returns to the trailhead, following the backcountry spur trail, reaching the trailhead at 8.5 miles and completing the adventure. Stay the night and extend the adventure! Vogel State Park offers great pioneer camping, campsites with electric hookups, and cottages for overnight guests (fees & reservations required). Or backpack this route and camp at a backpacking campsite (free, first-come first-camp) on the Appalachian Trail near the Blood Mountain summit. Campfires are not permitted in the Blood Mountain Wilderness, however, and food must be stored in a bear-resistant canister. And, wherever you camp, please remember to leave no trace to preserve the wilderness beauty.